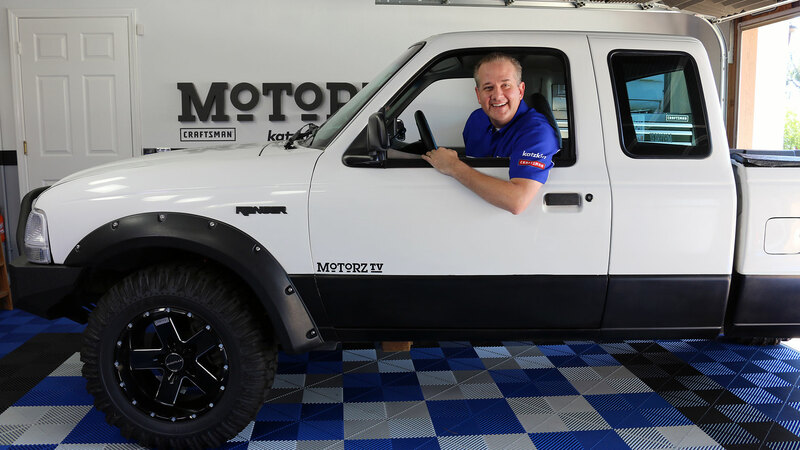 Chris Duke completes the 2000 Ford Ranger project truck, goes for a joyride with Vaughn Gittin Jr. at SEMA, and Alan Taylor goes to the reveal of the Dodge Demon in New York. Welcome to the 93rd episode of Motorz! In this episode (S07E09), Chris Duke works on the interior, completing the 2000 Ford Ranger project truck. Starting with making the doors look new again with Mothers Polishes, he continues on to install new Carhartt SeatSavers, a Dashmat, and UVS100 sunscreen from Covercraft. Those nasty old floor mats are ripped out and replaced with new ones from WeatherTech. Chris then gives you a taste of the 2016 SEMA Show, where our 2014 Jeep Wrangler project vehicle lived for a week at the Superwinch booth, and goes for a joyride with Vaughn Gittin Jr. in the parking lot out front of the Las Vegas Convention Center! After drifting with Vaughn, Chris interviews the man himself and gets some RCs from HPI Racing signed on the spot! Then Alan Taylor heads to the New York International Auto Show to interview Tim Kuniskis (Head of FCA Passenger Car Brands) about the reveal of the incredible new Dodge Challenger SRT Demon! Finally, Chris then answers viewer mail. Send in your letter by going to www.motorz.tv/letterz!